In a large space with an open concept, the arrangement of each area can be tricky. When done wrong, the whole space can feel cold, awkward, and unappealing. The key is to clearly define each space while creating a harmonious flow between them. 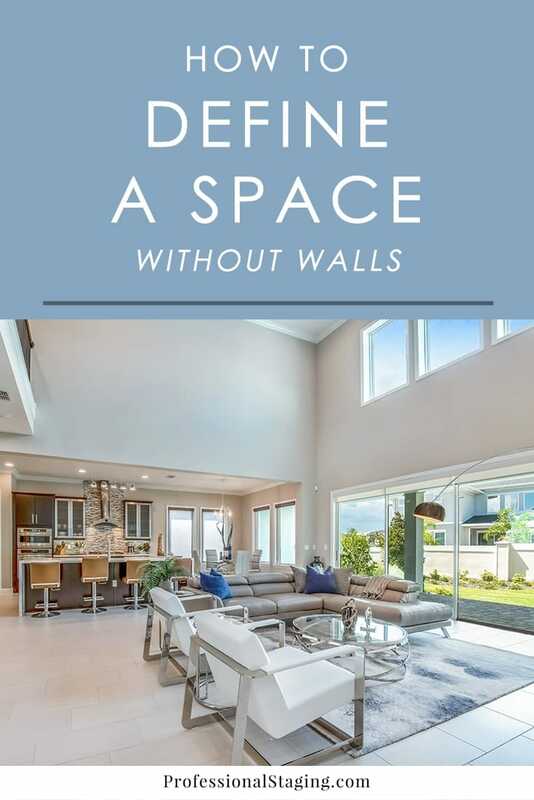 But how exactly do you define a space without walls? It’s a lot easier than you may think. Here are some simple, effective ways to define a space without walls and even create some privacy when necessary. An area rug is the quickest, easiest way to define a space. The right one will pull the space together and make it feel warmer, cozier, and more inviting. It’s also a great way to give the space more character. A natural fiber rug, for example, could bring in a rustic, coastal vibe, while a faux fur could elevate the glamour. In a large space where there are multiple area rugs, just make sure they complement each other. The way furniture is arranged has a big impact on the overall flow of a home. In a large, open floor plan, creating boundaries with the furniture is helpful in defining each space. For example, positioning a sofa in a living room so that the back faces the adjacent dining room. This clearly defines each space and creates conversation areas. Just be careful not to block doorways, sightlines or traffic flow with furniture. Color is one of the most powerful elements in decorating. It can even be used to give each area in an open space its own identity. The colors should all coordinate but be different enough that visually, each space has a clear and defined boundary. This can be done with small, subtle accents such as artwork and pillows or more dramatic ones like an accent wall or large, colorful pieces of furniture. Room dividers are great for offering privacy and definition to smaller areas of one large, open space. They are especially useful in studio apartments. A room divider can provide privacy to a bedroom area or home office, for example, to keep them separate from the public areas. Pieces that work well as room dividers are screens, bookcases, and curtains. ← Professional Staging vs DIY Staging: Which is right for you?